These may be one of my favorite baked goods I have made. Sift almond flour once (after measuring) into a large mixing bowl. Stir in the rest of the dry ingredients. In a separate bowl whisk the eggs, honey, butter and lemon juice. Add the wet mixture to the almond flour mixture and mix until well combined. Line a cookie sheet with parchment paper. Drop biscuit dough onto the cookie sheet by rounded tablespoons about two inches apart. You can make them fairly big. I ended up with twelve biscuits. Bake for 15 – 20 minutes until the bottoms are golden brown and the tops are set. I baked mine for 15 minutes and then moved them to the top rack of the oven for 3 or 4 more minutes so the tops would finish without burning the bottoms. Normally I grate the cheese, but I only had Tillamook sharp cheddar singles so I broke them into pieces (about 1 and 1/2 slices). This made little pockets of melted cheese, which I thought was really good. Wow, those look super tasty Sherry. I guess I pretty much wrote off biscuits when going on the SCD, but now there is hope afterall. they even look just like the ones I used to eat! These were so sooo good!!!! And easy to make!! Thanks so much. Thank you! 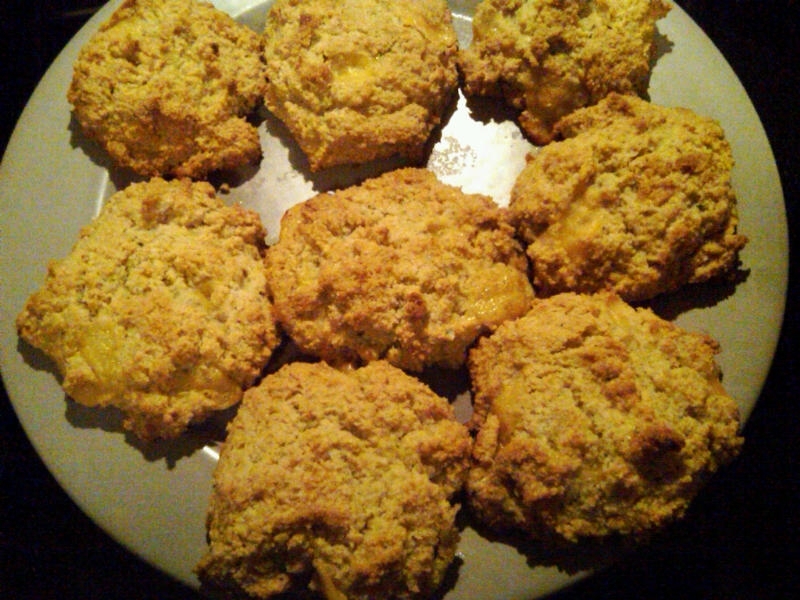 I can eat biscuits again thanks to your recipe. These were amazing and tasted just like real biscuits! Very easy to make. made these tonight! we are new to scd diet as husband is having bad flare up and these were so delicious!! thank you! I am allergic to almonds and I need to be on the SCD for UC. Can I substitute Coconut flour for the almond flour? You can definitely use coconut flour to make biscuits, but you won’t be able to directly substitute in this recipe. You will need to fine a coconut flour recipe. I don’t use coconut flour that much, so I don’t know one off hand. Do you think these need to be stored in the fridge? Yes, I pretty much store all the SCD baked goods in the fridge.